Supports livestock as it copes with acute stresses associated with illness, birthing, performance and travel. Restores wellness under stress with 4Life® Transfer Factor Plus® Advanced Formula, vitamins, minerals, electrolytes, probiotics and other essential nutrients. Provides the well-balanced nutrition needed to restore overall health. 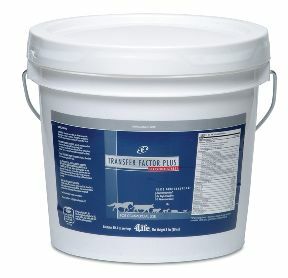 4Life® Transfer Factor Plus Livestock Stress Formula contains high levels of the immune-building 4Life Transfer Factor Plus Advanced Formula along with vitamins, minerals, electrolytes, probiotics and other essential nutrients that are critical for restoring wellness. “Two of my ‘barn’ cats have suffered every summer from problems with fleas and ‘hot spots.’ They were so sad and scruffy looking, that I hated to admit that they belonged to me, not to mention how uncomfortable and insecure they felt! Along with a flea control regimen, I started mixing Livestock Stress Formula with water and a bit of canned cat food, in individual dishes. They usually only get dry cat kibble, so the meat was very appetizing, and they lapped it all up. “In a couple of days the sores started drying up, and they stopped itching so much! In a week, they looked so much better that I reduced the amount I was giving them. In two weeks, their hair had started growing back in, and they started having a lot more self-confidence! The change in these two cats, is amazing!